I'm at the annual Society for American Baseball Research (SABR) convention--which happens to be in downtown Minneapolis this year--so blogging will be on hold until next week. My apologies for the lack of a Link-O-Rama, but in the meantime check out this St. Paul Pioneer Press article about the Twins' involvement with sabermetrics. 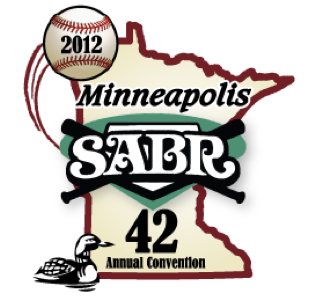 And if you're interested in updates on my SABR convention experience, follow me on Twitter. This week's episode of Gleeman and The Geek was minus The Geek, as Nick Nelson and Joe Nelson filled in for a vacationing John Bonnes as my guest co-hosts and topics included Matt Capps' injury and fill-in closers, Trevor Plouffe's case for the All-Star game, what to do with Francisco Liriano, buyers vs. sellers, Brian Duensing's move back to the rotation, more Josh Willingham heroics, Byron Buxton's debut, and why Bonnes shouldn't bother coming back. • Francisco Liriano had a 9.45 ERA, .346 opponents' average, and 21-to-19 strikeout-to-walk ratio in 27 innings over six starts when the Twins demoted him to the bullpen in May. Since rejoining the rotation he has a 2.67 ERA, .155 opponents' average, and 35-to-12 strikeout-to-walk ratio in 30 innings over five starts. It's hard to imagine the Twins re-signing the impending free agent, in which case he has another half-dozen starts to build trade value. • As if the Twins' farm system wasn't weak enough already now four of their top 10 prospects in my preseason rankings are on the minor-league disabled list. No. 7 prospect Kyle Gibson is still making his way back from last year's Tommy John surgery, No. 9 prospect Alex Wimmers is trying to rehab an elbow injury of his own to avoid the same fate, and now No. 2 prospect Joe Benson and No. 4 prospect Eddie Rosario are both sidelined for extended periods. Benson fractured his left wrist and surgery will keep him out until mid-July. Rosario was struck in the face by a teammate's line drive and is expected to miss six weeks after surgery to insert a metal plate above his lip. Benson had already been demoted from Triple-A to Double-A and wrist problems often linger, so his injury is the bigger long-term concern. Rosario's injury is also a shame, because it sounds gruesome and he was hitting .293/.363/.473 at low Single-A. • Sadly the "Free Anthony Slama" movement has been put on ice, and not because the Twins finally called him up after years of dominating in the minors. Slama is slated to miss six weeks after a line drive broke his leg, potentially ending his season with a 0.40 ERA, .175 opponents' average, and 37-to-12 strikeout-to-walk ratio in 23 innings at Triple-A. He'll be 29 years old before next season and has a 2.24 ERA with 172 strikeouts in 141 career Triple-A innings. • No. 42 pick Luke Bard was the last remaining holdout among the Twins' top 11 draft picks and the Georgia Tech right-hander agreed to a deal yesterday, meaning just two weeks after the draft they've signed every player selected within the first 250 overall picks. No. 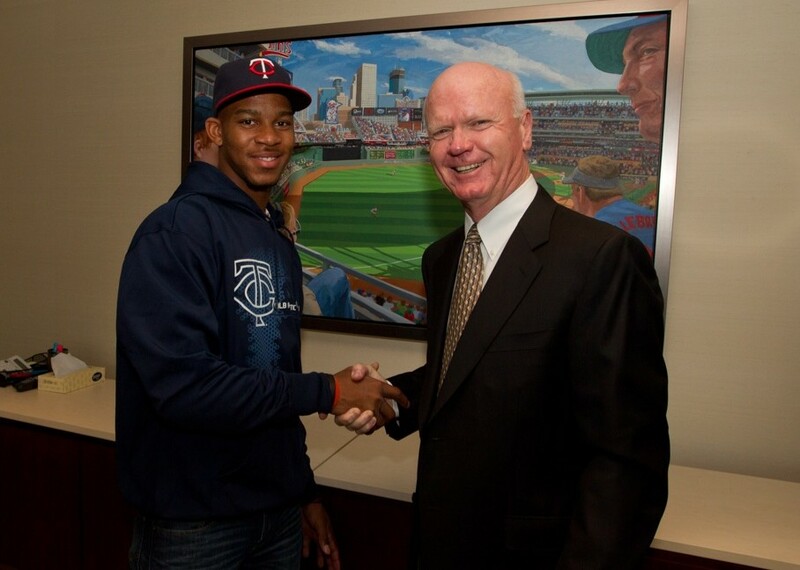 2 pick Byron Buxton is expected to make his rookie-ball debut within a week, so the earlier signing deadline as part of the new collective bargaining agreement has worked well for the Twins. • Ben Goessling of the St. Paul Pioneer Press reports that in preparing scenarios for the No. 2 pick the Twins narrowed their list to Buxton, Carlos Correa, Mark Appel, and Kyle Zimmer. Most pre-draft speculation had them choosing whichever one of Buxton or Appel didn't go No. 1, but in reading between the lines it seems like they were set to take Correa if the Astros had taken Buxton. And there was lots of organizational disagreement about the best player. 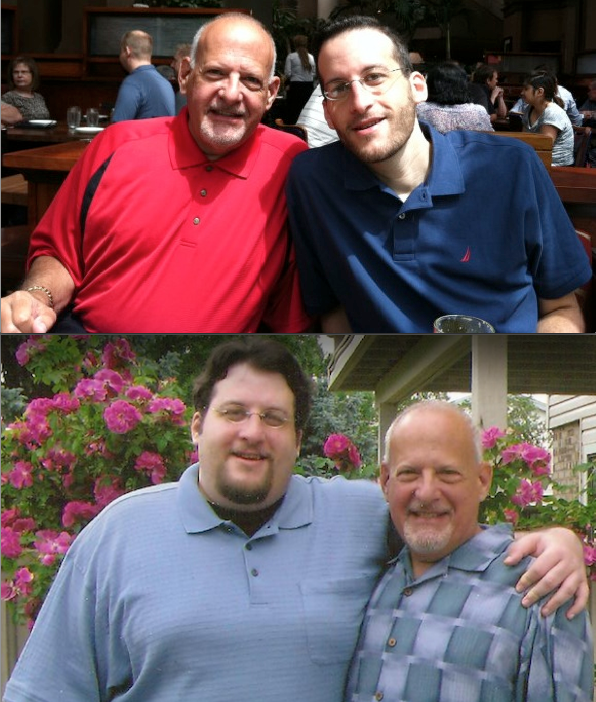 • In examining the Twins' draft it was obvious that they went out of their way to get power arms, even if they came in the less-than-ideal form of college relievers. Sure enough vice president of player personnel Mike Radcliff admitted that was the plan going in, saying: "Pitchability and playability, maybe we overemphasized that. Maybe we emphasized that for too long. It added up. This year, we went for the more presentable qualities." • Going into the draft Mitch Brown seemed destined for the Twins, as they had six picks in the top 100 and the local right-hander from Rochester Century high school was regarded as a consensus top-100 player. General manager Terry Ryan even scouted him in person multiple times, but then the Twins passed on him at 32, 42, 63, and 72. Brown wound up with the Indians at 79 and signed for an above-slot bonus of $800,000. • They also repeatedly passed on Gophers right-hander T.J. Oakes, who was selected by the Rockies in the 11th round and signed for $100,000. Oakes is considered a marginal prospect, placing 292nd in Baseball America's pre-draft rankings, but the Twins liked the 6-foot-5 starter enough to draft him in the 41st round last year as a sophomore and have a history of picking Gophers. Oakes had a 2.31 ERA and 78-to-15 strikeout-to-walk ratio in 97 innings as a junior. • Released by the Twins with an 8.47 ERA and more walks (14) than strikeouts (12) in seven starts, Jason Marquis signed a minor-league deal with the Padres and made one Double-A start before returning to the majors. Marquis and his agent were smart to choose an NL team with MLB's most-pitcher friendly park, but this is crazy: Through three starts he has a 1.86 ERA and 20/8 K/BB ratio in 19 innings, including his first double-digit strikeout game since 2001. • Waiver claim Erik Komatsu became expendable once the Twins decided to recall Ben Revere from Triple-A a month ago, so the Rule 5 pick was designated for assignment and predictably the Nationals accepted his return. Komatsu had more upside than the guy he replaced as fourth outfielder, Clete Thomas, but there wasn't much fit for him on a roster that includes both Revere and Denard Span. He's back at Triple-A for the Nationals. • Speaking of the Rule 5 draft, Terry Doyle is headed to Japan after the Twins selected him with the No. 2 pick only to send him back to the White Sox in spring training. Doyle rejoined the White Sox at Triple-A with a 2.83 ERA and 71-to-18 strikeout-to-walk ratio in 76 innings, including a near no-hitter against Rochester, but they agreed to release the 26-year-old right-hander so he could sign with a Japanese team. A fitting end to an all-around weird story. • Phil Dumatrait, who was pitching in Rochester's bullpen after spending much of last season with the Twins, announced his retirement at age 30. He spent parts of 10 years in the minors and finishes with a 6.20 ERA in 151 career innings as a big leaguer, but the 2000 first-round pick had enough smoke and mirrors to post a 3.92 ERA in 45 appearances for the Twins last season despite an ugly 29-to-25 strikeout-to-walk ratio in 41 innings. • Kevin Mulvey also called it quits, becoming the first player from the Johan Santana trade to retire. At the time of the Santana deal Mulvey was 23 years old and the former second-round pick looked like a potential mid-rotation starter who was billed as close to MLB-ready, but he posted a 7.90 ERA in 27 innings as a big leaguer. He was a bust, but the Twins managed to get some value out of Mulvey by trading him to the Diamondbacks for Jon Rauch in mid-2009. • Ben Nicholson-Smith of MLB Trade Rumors crunched the numbers on every team's payroll commitments for next season and the Twins have the 13th-most money already spent at $65 million. This year's payroll is around $94 million, which represents a 17 percent drop from last year's $113 million. • Trevor Plouffe isn't the only Twins hitter putting up big numbers since May 15. Through that date the Twins' lineup scored an average of just 3.3 runs in 36 games, but in 31 games since then they've averaged 5.2 runs. • Alex Burnett has a great-looking 2.16 ERA, but he's gotten it done with a ton of smoke and mirrors while posting a horrid 13-to-9 strikeout-to-walk ratio in 33 innings. Burnett's strikeouts per nine innings have plummeted from 7.0 in 2010 to 5.9 in 2011 to 3.5 this season, which is the lowest mark by any reliever in baseball. • Jim Thome has hit .315 with 61 homers and a .640 slugging percentage in 194 career games against the Twins. He hit .266 with 37 homers and a .562 slugging percentage in 179 games for the Twins, producing the highest Isolated Power in team history. • Paul Konerko (.431) and Joe Mauer (.415) are the only hitters in the American League with an on-base percentage above .400. • Justin Morneau is hitting .310 with a .595 slugging percentage against right-handers and .091 with a .197 slugging percentage against left-handers. • Lew Ford, who last played in the majors for the Twins in 2007 and is now 35 years old, has hit .383/.450/.626 with five homers and four steals in 28 games at Triple-A for the Orioles. 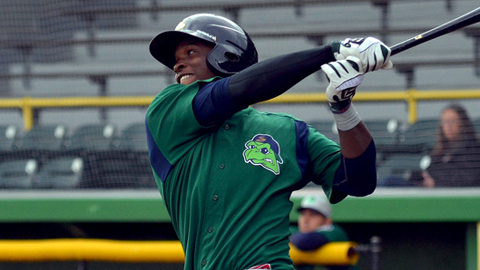 • John Sickels of MinorLeagueBall.com took a trip to Beloit to see the Twins' low Single-A team and had some interesting thoughts on a variety of prospects, including a pre-injury Rosario. • ESPN.com ranked the 25 best single-game performances in postseason history and two of the top three spots belong to Twins. • I was a guest on the Bucs Dugout podcast, talking about the Twins and my decade blogging about them with host Charlie Wilmoth. • And if you haven't listened to this week's Gleeman and The Geek episode yet, the show was a good one as my guest co-hosts Parker Hageman and Joe Nelson subbed for Wally Pipp. This week's blog content is sponsored by DiamondCentric and their new "Plouffe There It Is!" shirt, which is available in men's and women's sizes. Please support them for supporting AG.com.